A tale of how something else awful became part of my teaching practice. Or, how anything can have a sliver lining professionally. Eventually. 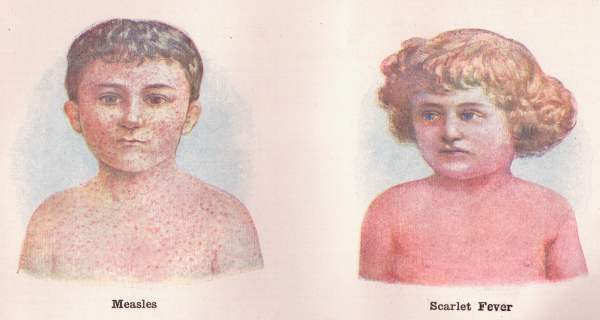 Some months ago, I wrote a post about how I caught scarlet fever. I described it as the worst CPD ever. Apparently, I was in error. I had forgotten something far worse. It became relevant to my teaching for the first time ever last week. So, here’s another tale of gruesomeness and how it became grist to my learning mill. recently, I have found myself teaching a session at the National Army Museum about prosthetic limbs and robots. The session is fairly straightforward: it looks at soldiers who have prosthetic limbs and asks the children to carry out a simple task using a robot arm. The children are asked what task they think soldiers would feel most of a sense of independence from being able to carry out without assistance. Invariably the children (or, in one case, the teacher), identify going to the toilet. That’s not the task. The simple task is to make a cup of tea. It’s not as easy as it looks, which is rather the point. In the course of delivering one of the sessions, a child asked me whether I have any prosthetics. A reasonable question, I suppose. After all, how can I speak from a position of knowledge if I have no first-hand experience of the situation? I looked at myself and admitted that I was largely complete, but carried on to talk about the work I have done with Hasler Company, the Royal Marine rehabilitation unit (now officially Hasler Naval Service Recovery Centre), and how I had worked with and come to understand the issues and emotions of service personnel with life-changing injuries. It felt like a bit of a soft answer, but they seemed happy with it. Anyway, they enjoyed the session and went away happy. Besides, I can’t beat myself up for not having experienced everything I teach about. Wait a moment. Does that mean I have prosthetic teeth? Yes, I think it probably does. I did lose them in a life-changing incident and they’re never growing back. How does one “lose” teeth? In the summer of 2002, I was in a road traffic incident where, to cut a long story very short, I collided with a Land Rover when riding my bike. The slightly longer version is that the driver overtook me and then stopped very suddenly, so I crashed into the back of the car, taking out their back windscreen with my face. Or, at least, that’s what I’m told happened. I remember trying to work out where my glasses had gone because I couldn’t see. Then I was rushed to hospital by ambulance and straight into A&E. A battery of tests, x rays, scans, some maxillo-facial work and a lot of stitching later I was sent to bed on a ward. It turns out I was lucky to come out of it in one piece. In the days before omnipresent mobile phone ownership, getting a message to my family was…tricky. It wasn’t until the following morning that I was even allowed to look in the mirror. I discovered that, although I hadn’t broken anything, my face was a mess. In fact, I looked a lot like Robert de Niro when he played Frankenstein’s monster. It was not a pretty sight. And I couldn’t speak. That was mostly because I’d knocked out several of my top teeth in the impact. Others were glued in place in a desperate attempt to save them. Later that day, I was sent home with instructions to take it easy. That wasn’t difficult: I felt like I’d been hit by a car. Within a fortnight it became clear that all of my front teeth at the top were either gone or going go. I was fitted with false teeth: dentures. Dentures!? I was 25. People my age are not supposed to have to buy strident and denture glue. On a number of occasions, I was actually asked if I was buying them for my gran. Nothing is guaranteed to make you feel old better than that. Dentures are rubbish. They never feel like they belong. They have an annoying tendency to fall out when you least need it. I will never forget the look on someone with whom I was sharing a climbers’ bunkhouse when I produced a glass while brushing my teeth and proceeded to spit my front teeth into it. Talk about mood killer. I had the dentures for a year. A year of hospital visits, of long sojourns in the dentist’s chair and painful procedures. At the end of it I was the proud owner of a bridge. It’s basically a set of false teeth that are glued in place, stuck over my canines. I’ve had them for fifteen years now. Most of the time, I can almost forget they are not my real teeth. They don’t hurt and they fit pretty well, all thigs considered. I’ve had to relearn how to whistle, how to eat apples, in fact anything hard, I have to be careful with drink because of the odd shape of my lips, I can tell when I’m dehydrated because the bits of road in my lip come to the surface, things like that. I can no longer do my party trick of picking up a full glass of drink with my teeth, the bridge is too expensive. They feel almost “normal”. Almost. Most of the time. Sometimes, it feels like I’m wearing a gumshield. After all this time, I usually forget that this isn’t the way I have always been. Except when I try to whistle. So, I don’t consider myself an amputee. That would be greatly overstating it. But, there is less of me than there used to be. I have had to get used to the fact that by body is different, that I look different, that a part of me is artificial and might break in normal use. Thinking back on it, there was considerable emotional adjustment. Oh yes. If I dig a little, I do have some insight into what it feels like for a catastrophic (potentially fatal) incident. It’s an insight that I can bring to bear when teaching about traumatic experiences. So, next time I am teaching a class and someone asks that difficult question, I will have to remember to say yes. It will make my teaching better. I would not recommend this as a way that anyone else can hone their teaching craft. I wouldn’t wish it on my worst enemy. It was awful, but it has helped me. Just like the Scarlet fever, you will be pleased to know that I have no plans to use bloody pictures of my own face to illustrate learning sessions. I am aware that I’ve been a touch taciturn recently, please bear with me: there is exciting stuff just around the corner. It’s been a difficult autumn here at Past Participant Towers. Things have been happening behind the scenes that have conspired to distract me from writing and updating things as often as I’d like. I’m not going to go into any detail but suffice it to say that autumn has brought bad news for us on a number of fronts. I can only apologise for the break in service, it wasn’t what I had in mind during the summer but it’s what happened. Consider this post an announcement that Andy is back in the saddle and that we will be updating things much more frequently in future. There is plenty to look forward to over the next few weeks. I’ve got a backlog of stuff to go up that should be a lot of fun. I’ll keep you posted: I hope you like it. This week I found myself doing research on historic illnesses. In this case it’s not for a learning session but because, apparently, I’ve been suffering from scarlet fever. I’m used to researching all kinds of slightly odd subjects. All sorts of weird and wonderful things have been on my radar at one time or another. Former heads of the KGB? Check. How to construct a dirty bomb? Check. The background and history of various paramilitary groups? Check. Peculiar illnesses of sailors (not that sort)? Got. The Latin name of Stella’s Sea Eagle? Done that. All in the name of genuine academic research for a learning session of one variety or another. Not this week. This week I’ve been researching something because I have been the victim of it. This is, without doubt, worst research I’ve ever done. Last week, as I was minding my own business in the shower, I looked down and noticed that my arms were the wrong colour. The colour in question was scarlet. Being bright red is never a good sign. The only thing that is worse than being bright red is realising how red you are based on the little blotchy bits that aren’t. Those little blotchy bits were confined to the inside of my elbow and by armpit. Being the only person in the house, I started ever so slightly to worry. As I called NHS Choices (or whatever they call NHS direct now) I started to run through the things that it might be: none of these were places I particularly wanted to go. The result of that conversation was that they thought I was to get myself to hospital post-haste. A short taxi ride later I was sitting A&E waiting to be seen. A few short hours later and I was sent home reassured that I was indeed having an allergic reaction to something, though exactly what that something was wasn’t entirely clear. A bit of a pain, thought I, but something that could be lived with. I took this picture in A&E. The light is pretty awful, but this lurid rash was all over me by this stage. that night I completely failed to sleep. The following day I felt like I had been run over. Everything ached. My hands and wrists and arms were swollen. And I was doddering round like an old man. In short: it was rubbish. “Oh well,” I’ll just muddle through this and, sooner or later, I’ll be right as rain again. Turns out that the emphasis would be on later rather than sooner. I shuffled through that day, the following day, the weekend and, eventually, admitted that if I still felt this bad on Monday morning I’d call the doctor. Well that answers that then. That would explain the aches and pains, rash, feeling wrung out, everything. Just a quick blood test in the morning to confirm all of this. So, I went home and did what any self-respecting education professional would do next: I sat down and researched what the hell it was I’d been diagnosed with. In many ways it was a lot like being at work. It was like those situations where someone says: “Andy, do you think you could put together a session on this?” To which I always reply: “of course I can.” Before heading off frantically beginning to research it. That evening was pretty much the same. I was starting from a base knowledge on streptococcal infections of approximately zero (except that I’d heard of some of the diseases and courses). The learning curve was, unsurprisingly, really rather steep. The other way in which this was much like preparing for a learning session was this: no one gets scarlet fever any more. I found myself reminded of Terry Pratchett’s “the Colour of Magic” which finishes with Scrofula turning up to collect the soul of the main character. The would-be Grim Reaper is rebutted thusly: “nobody dies of scrofula any more”. I felt very much the same about scarlet fever. Here I was researching an illness that nobody gets any more. Nobody, that is, except me. It was much like the times in the past when I have prepared learning sessions on scurvy or typhus or dysentery. These were not diseases of which I expect to gain first-hand knowledge. And yet here I was with a list of symptoms ticking each one off with a sage nod and a mutter of “yup, got that.” There was a certain grim humour attached to the whole process. so, what have I got out of the whole experience? I did have a rash, but that’s gone away now. I still have a lot of aches and swollen joints. What I’ve really got out of this is a sense of empathy with sufferers of illnesses, diseases and conditions that are (thankfully) largely considered to be historic. No longer do I view the poor unfortunates who have suffered from these diseases as characters but as real people groaning and mumbling about how unwell they felt. And rightly so because, if they felt anything like I do, they felt awful. As well as empathy, I also feel a sense of genuine sympathy for fellow sufferers. The downside of all this is that, whilst I have discovered many new and exciting things, I have been far too unwell to do any actual work. Preferring instead to shamble listlessly around complaining about how my hands and wrists hurt. Notable things that cause significant pain: using a keyboard and opening door handles. Both of which feature fairly heavily in my daily routine. Excitingly, I have been able to circumnavigate the first of these by beginning to work with voice recognition technology (which feels a lot like the future). You will, however, be pleased to hear that at no point do I plan to develop a learning session using photos of my own ill-health as teaching resources. As the dust settles on the Remembrance season for another year and we lay to rest the centenary of the Battle of the Somme, I have a story of personal struggle and personal triumph to tell. It is 10:50 on Friday November 11th. I have just delivered the second of six sessions I am due to deliver today but already my brain has moved on and is focussing on the next appointment of the day. When I say focus, I mean a laser sharp, all-encompassing focus on what I am about to deliver. I am not going to lie to you: I am feeling the pressure. I am about to deliver a one-off, single-take, no second chances, must be perfect first time session. Why am I feeling so much strain? Let me take you back in time a little. 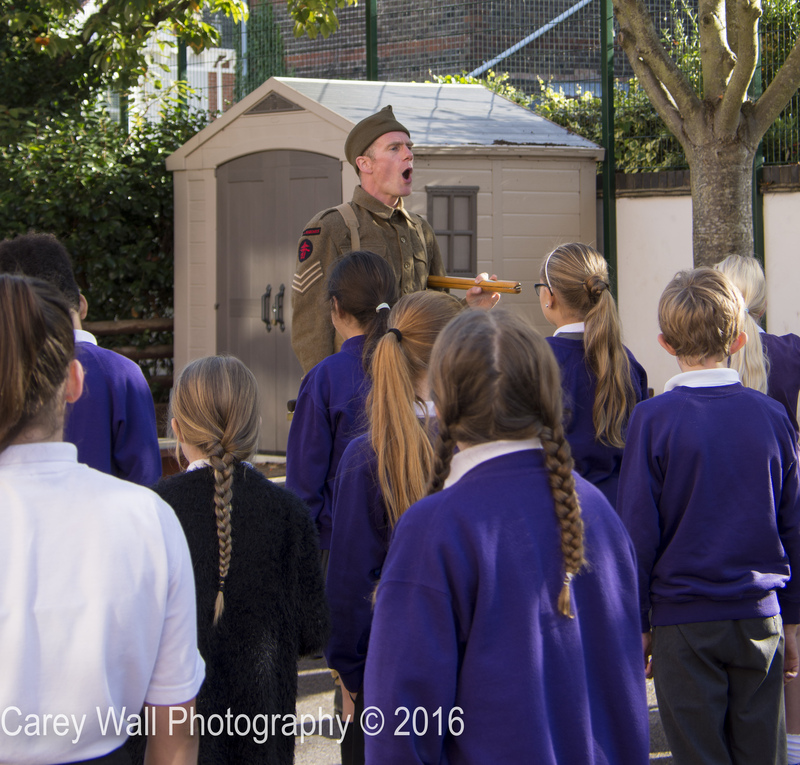 When I made the booking to visit a school on November 10th and 11th, away back in May, I was really excited to be delivering Remembrance sessions to an entire school. I love the opportunity to make an impact and to leave a lasting impression. Talking about Remembrance on Armistice day is just such an opportunity. Part of the booking was that I would deliver an assembly to the school on both days. No problem, I could do a session teaching drill. It’s a great wee session that works better the more people you have. Then, a month or so before the visit, the teacher asked me if I would do an assembly on the Thursday and lead the school Remembrance assembly on the Friday. “Of course I can.” The enormity of what I had offered hit as soon as I pressed send. I was offering to lead a service of Remembrance for an entire school. Some things are important. Some things have a very precise, correct way of doing things. Some things you are morally and ethically obliged to get perfectly right. A Remembrance service is all three of these things. I have attended many services over the years, I have formed up groups of students for the 2 minutes silence, but I had never actually led the service. This was new territory. This is not the time to be hoisted on my own petard. There is no wriggle room, no chance to improvise. This needs to be perfect. First time. With no notes. So I set about memorising the order of service. I set about memorising the Exhortation. I set about knowing the whole of the Last Post and I practised my bosun’s call. All in all it’s a lot to remember. Especially when you slot it into the middle of a day where I had to deliver six sessions about D Day. So that’s why I’m feeling nervous. I am acutely aware of everywhere my Second World War uniform is not sitting quite right. Every pace it’s digging in. I am abundantly aware of how hot the school is and I am beginning to get sweaty palms. I walk into the hall to be met by hundreds of small faces and the entire school staff looking at me. Also I am greeted by a Corporal from the REME who has offered to attend the service. I suddenly feel that my battledress is very out of place for this service, but there is no time to change and therefore I must focus and get this right. I nod to the teacher with the laptop and the Last Post sounds from the PA. It takes an eternity to finish. Age shall not weary them, nor years condemn. Announce the two minutes silence. Sound the call. Glance at my watch and remember the time. Think about all the things I ask the children to remember. Think about the people who I talk about in my remembrance sessions. Think about the people I have known who have made the ultimate sacrifice. Sound the call to end the silence. And then finish the service by taking the children through their drill before dismissing them. They were absolutely brilliant. They managed to be silent and, relatively, still for the whole two minutes. Their drill was perfect. I have never felt such a wave of relief and pleasure at having successfully completed something. I put a lot of pressure on myself to get it right, because it was important. It was important to me to make sure I did this properly and it’s important to other people that I did this right. I’m not kidding myself. Compared to being involved in a conflict, I was risking very little apart from opprobrium. Compared to the fear that soldiers feel going into combat, I felt very little. However, I had done my bit to remember their experiences and to help others remember them. I had treated the occasion with the respect it deserved. I had done my bit to remember and to keep the memories alive. July 1st marks one hundred years since the whistles blew on the offensive that would start the battle that would later become known as the Battle of the Somme. This campaign has become indelibly etched on the consciousness of the country. The Somme has come to stand for the horrors of trench warfare, for the Sheer awfulness of the Western Front and for the First World War as a whole. In fact, so large is the shadow of the Somme, you could be forgiven for believing it was the only thing that happened in the entire war. Sadly, for all the unimaginable scale of the Somme and everything it entailed, this is not the case. Service personnel were in harm’s way and paying the ultimate price long before July 1st 1916 and long after November 18th. In spite of banging the drum for widening consciousness of the war beyond the Somme, its shadow is just too big not to commemorate. A single person losing their life is tragic enough, fifty-seven thousand casualties is beyond imagining. Fifty-seven thousand men killed or injured. And then the campaign went on for four and a half months. Much has been said on the horror of the Somme. Writers, poets and commentators far more eloquent than I have created a huge canon of judgements, commentaries and moving tributes about the battle and its impact. I will not muddy the waters. Instead, as I have done before, I will clear the stage and move aside to let someone else have the spotlight. Allow me to introduce you to William Charles Brown RMLI. 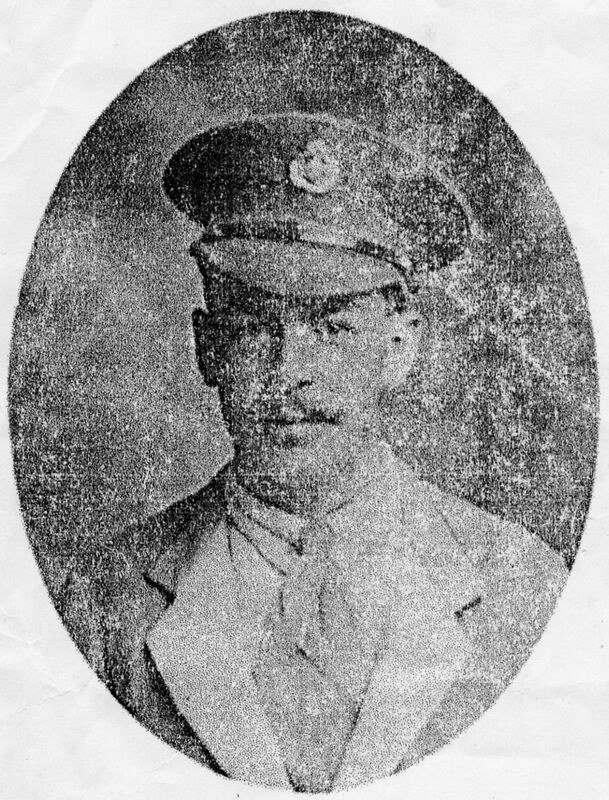 William Brown Joined the Royal Marine Light Infantry in November 1914. In April 1915 he was given a sun hat shipped out for Gallipoli. No words can describe it. The conditions were horrible, lack of water, disease, stench, heat and most horrible of all: the flies and lice! He was offered medical leave but chose to remain to look after an old friend who had contracted dysentery. Eventually the wound became infected and he was invalided to Egypt. Probably the biggest regret and mistake of my whole life. He was instead sent to the Western Front to join the Royal Naval Division. And we finished up on the Somme. Autumn had set in and we had a lot of rain and the trenches and land had become a quagmire. To make matters worse it had turned bitterly cold. From now on we were invariably soaked to the skin and often up to our waist in mud and water. Its most amazing that anyone could possibly survive such conditions. This is without the enemy even getting a mention. His moment came with the Battle of Ancre, at the end of the Somme. We took up our positions and waited for zero hour at 5.45am. The Res had mined …Jerry’s trenches and these mines were being sprung at zero…Bang on the dot up went the mines and every machine gun along the front opened up, the attack was under way. From the brow of the hill…was a quagmire and unoccupied….I shared a shell hole with 2 or 3 mates. We had suffered pretty heavily by this time but the attack was going very well all along the line. When we got the order to advance I heaved my gun up on to my shoulder and climbed out of the shell hole pulling myself up with my right hand. As I put my hand on the rim to get to the top I had a bullet through it. I stopped and looked at it; then had a good mutter as it didn’t look like enough to go back with yet it would be damned inconvenient to carry on with. The bullet had gone through my knuckles in front of my little finger and it appeared to have split my thumb. Bear that in mind when he decided to carry on rather than getting it seen to. However pretty soon it seemed he had underestimated it. …so I had another look at my hand. The two middle fingers were hanging down there was a gaping hole through the palm. I could have poke four fingers through, and instead of the thumb being split it was gone. And when I lifted it up for a better view the two fingers hung down the back of my wrist and a slab of meat flopped down the front of my wrist from where my thumb had been. Ouch. So he carried out a little first aid on the wound. I lifted the fingers back up and over into the palm, and slipped my fingers under the slab back over the stump and held it in place. It was all up for him so he handed off his gun to a member of the Honourable Artillery Company called Beresford and set off for the field station. Just then a shell exploded right behind him. When the smoke cleared both Beresford and the gun had vanished. He then began a long and fruitless quest for a dressing station. When he eventually found one.. I poked my head round the entrance, saw a table and a form so I sat on the form and promptly passed out. William Brown’s involvement in the offensive had lasted about two and a half hours. The tale of his treatment and recovery is one for another day, but he lived until March 1971. I know this is a graphic account but there is a reason. William Brown sustained a relatively minor injury. This graphic tale was repeated nearly half a million times over the course of the Somme. Half a million tales, all as bloody as this one. Half a million men, each of whom had to experience the kind of injury and pain that, thankfully, few of us have to face now. When I think about the Somme, it’s not the numbers that get me. It’s the fact that even a single one is too tragic to bear. It’s too tragic and yet, in the scheme of the war, insignificant. That’s the power of the Somme: to make something as traumatic as this insignificant. I shared this short clip on Facebook the other day because it was important. It’s important because it’s a human story that needs to be told. I’m not going to blow the story by telling you what it’s all about: just spend a couple of minutes watching it. It comes from a film called Human. It is the story of a Nazi holocaust survivor. It’s a story that is well known and well-trodden. Then it changes and becomes human. It’s also important because it chimes with what I’ve been trying to do with the history sessions at Past participants. I am talking about the power of the story of the individual. A story that has the potential to illuminate world-changing events, making them real, on a human scale, intelligible. These stories are often lost in the sheer scale of these cataclysms. The First World War is just such an event. It’s too huge to truly comprehend, even for someone like me whose job is to understand and elucidate it. There are simply too many people, in too many places, having too many awful things happen to them to get your head round. This is why we have ended up with what I’ve called the “Tommyfication” of the conflict. The reduction of the entire war to the story of Tommies in muddy trenches on the Western Front, told through the lens of Siegfried Sassoon and Wilfred Owen (or even Blackadder). There is nothing wrong with this picture in itself. It’s when we extrapolate this simple picture to the entire war that we run into problems. Think about it for a moment: at the battle of Passchendaele (or third Battle of Ypres) alone there were 50 British and 6 French Divisions. That’s just over a million men on the allied side, of whom between 200,00 and 400,000 ended up as casualties. Think about that for a moment. To presume that their experiences were broadly similar doesn’t really make a lot of sense, even if you assume that they were all riflemen and ignore all the engineers, artillerists, messengers, signallers, medical staff and other assorted specialisations. The reason for it is simple enough: it’s easier to get your head round it if you’re dealing with multiples of similar stories, ie numbers. When I set up Past Participants I wanted to approach the story from a different angle. I wanted children to encounter individuals, real people and their real stories. Sometimes those stories align with the recognised narrative and sometimes they run counter to it, but that’s because they were real people. I wanted children to encounter these individuals unencumbered by the numbers and statistics. I wanted them to feel that they had a handle on who these people were and what they were doing on the battlefield. I wanted these people to have a name and a face to go with their story. These stories are often more interesting in their wrinkles than the “barbed wire and machine guns” narrative. This is why I’ve had year 6 children ask, 2 years after they last saw me, “are we going to find out about Andrew Turnbull again?”. That is the impact of the individual when the class feels a sense of ownership. I’ve found that, once they know how much detail there is in two stories, then suddenly children see that 200,00 stories is no longer a number, it’s a sense of scale. They realise that we could zoom in on any of these individuals and find something the same and yet different. This is the jaw-drop moment, the light bulb moment when suddenly the size of what we’re talking about makes sense. Seeing that moment makes it all worthwhile. It’s why I keep doing this. This premise is the basis for my First World War history sessions. I deconstruct the “Saving Private Ryan” narrative in the same way when I do my D Day sessions, using the actual memories of those who were there to similar effect. Have a look at them.